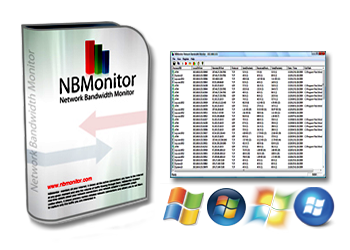 NBMonitor is network traffic analyzer and bandwidth monitoring software. The software tracks Internet bandwidth usage, monitors all your Internet, shows all the active connections you have to the Internet at any given moment and also the volume of traffic flowing through them. NBMonitor allows to monitor and analyze your network traffic, discover traffic patterns, track internet bandwidth (upload and downloads) usage, view all the active connections to the Internet at any given moment and also the volume of traffic flowing through them. As a number of ISP’s are now disconnecting customers for using “too much? bandwidth, knowing exactly how much you’ve downloaded or uploaded in a given month can be very helpful. If your computer connects to Internet via an ISDN, DSL, ADSL, cable modem, dial-up modem, or VPN, you can monitor the Internet bandwidth in real time and get your total bandwidth usages to avoid overshooting your Broadband limitation. You can view the statistical information about your network traffic that passes through network adapters and display incoming, outgoing and summary traffic statistic. With Office NBMonitor you can scan all computers in your company without limits. Office NBMonitor is the easiest to use toolkit on the market. "Thank you for creating such a nice tool. saved me time and money. It was easy and fast. Thanks a lot..."
"Your software has been awarded by our editors Great job, we're really impressed! "I have run a scan on my network using and am happy with the results"